New dinosaur Fingerlings are here and they're ready to ROAR! New dinosaur Fingerlings are here and they’re ready to ROAR! Remember those funny little monkey Fingerling toys that sing, laugh, burp and fart? Unsurprisingly, kids went bananas for them at the end of 2017. It’s time to prepare yourselves to be dragged to the shops once more, because they’re back and this time kids will be wiggling ferocious raptors at their fingertips instead. When you’re on to a good thing why stop? 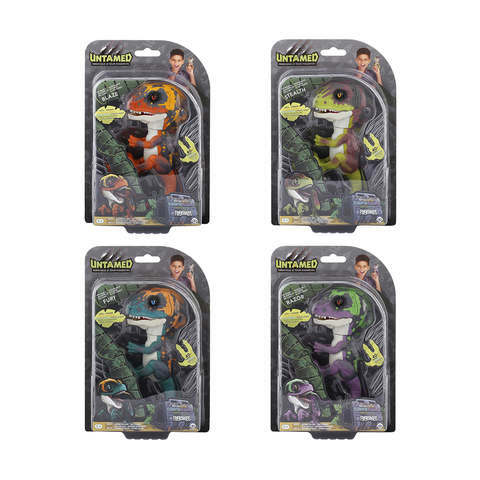 WowWee, the makers of Fingerlings, have decided to cash in on the whirlwind success of their Fingerlings (they also had unicorn and sloth versions) by releasing a the UNTAMED raptor series of interactive finger clinging pets. With their snapping jaws and gripping claws the new UNTAMED raptors are fierce and unpredictable, but they can also be friendly – if you tame them that is! Just like their wildly popular predecessors, the raptors react to touch, motion and sound with over 40 different sounds and animations, and yes, they also fart. The control is completely in your hands, so you can learn how to tame them or get chomped — it’s all up to you! The UNTAMED raptors come in four different characters, each with its own name, colours and individual personality — Stealth, Blaze, Fury and Razor. Collect them all to unleash their full fierceness for the ultimate prehistoric pet party. Quick! Where can I get one? The UNTAMED raptors don’t arrive in the US until May but luckily for us they’ve just been released in Australia. Suitable for children aged 5+, you can snap one up at Kmart for only $25. When you think about it, it’s a small price to pay for hours of high-tech Jurassic madness really. Don’t dawdle! Run to the shops like you’re Chris Pratt being chased by a T-Rex, because we’re predicting bad boys will sell out just as fast as their monkey counterparts.